Andy Warhol was born in Pittsburg, Pennsylvania on August 6, 1928. He first became well known for his works in pop art. Warhol was an early adopter of the silk screen printmaking process as a technique for making paintings. His earliest silkscreening in painting involved hand-drawn images though this soon progressed to the use of photographically derived silkscreening in paintings. Prior to entering the field of fine art, Warhol's commercial art background also involved innovative techniques for image making that were somewhat related to printmaking techniques. When rendering commercial objects for advertising Warhol devised a technique that resulted in a characteristic image. His imagery used in advertising was often executed by means of applying ink to paper and then blotting the ink while still wet. This was akin to a printmaking process on the most rudimentary scale. Warhol's work both as a commercial artist and later a fine artist displays a casual approach to image making, in which chance plays a role and mistakes and unintentional marks are tolerated. The resulting imagery in both Warhol's commercial art and later in his fine art endeavors is often replete with imperfection—smudges and smears can often be found. In his book "POPism" Warhol says, "... when you do something exactly wrong, you always turn up something." He began exhibiting his work during the 1950s. He held exhibitions at the Hugo Gallery, and the Bodley Gallery in New York City and in California his first West Coast gallery exhibition was on July 9, 1962, in the Ferus Gallery of Los Angeles. The exhibition marked his West Coast debut of pop art. Andy Warhol's first New York solo pop art exhibition was hosted at Eleanor Ward's Stable Gallery November 6–24, 1962. The exhibit included the works Marilyn Diptych, 100 Soup Cans, 100 Coke Bottles and 100 Dollar Bills. At the Stable Gallery exhibit, the artist met for the first time poet John Giorno who would star in Warhol's first film, Sleep, in 1963. A pivotal event was the 1964 exhibit The American Supermarket, a show held in Paul Bianchini's Upper East Side gallery. The show was presented as a typical U.S. small supermarket environment, except that everything in it—from the produce, canned goods, meat, posters on the wall, etc.—was created by six prominent pop artists of the time, among them the controversial (and like-minded) Billy Apple, Mary Inman, and Robert Watts. 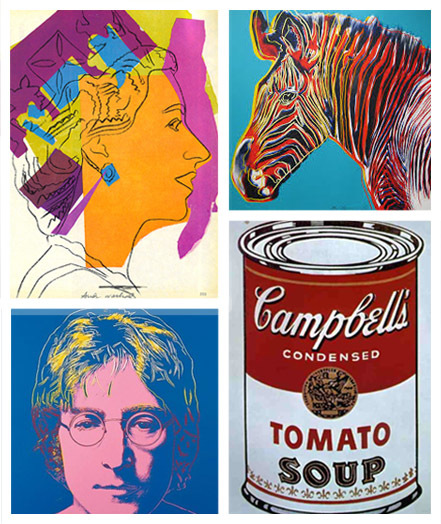 Warhol's painting of a can of Campbell's soup cost $1,500 while each autographed can sold for $6. The exhibit was one of the first mass events that directly confronted the general public with both pop art and the perennial question of what art is.